Sharon, one of my Muscovy duck hens, went broody rather late in the year - and she only had two eggs. Halfway through the brood time, one of the eggs was pushed out of her nest so I disposed of it. More weeks went by as she sat on just one egg. On Friday her one little duckling hatched. Yes, evidently the feed bowl is the most comfy place to sit. 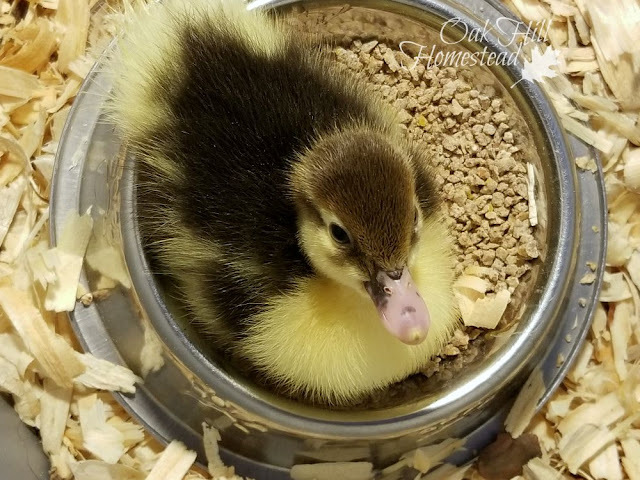 You can read about Sharon's first clutch of ducklings here and how my farm sitter came to the rescue. By the way, Papa Duck is going to a new home soon. His oldest son Frank (Sir Frances Drake) doesn't kill ducklings and will replace him in my small flock.